"What I've been up to Wednesday." A series of post that will recap what I have been doing over the past week. Whether it be projects, travels, events of daily life, you will find it here. We have been busy getting ready for Halloween. I can honestly say it's not one of my favorite holidays. But since the kids have started to like it and get into it, I figured I had better get on board. We keep things more on 'cute' side of the decor instead of scary. Here are some of my latest creations. My Burlap wreath that I talked about here and found here. With embellishments from the $1 Halloween rack at Walmart. Look how cute those spiders are! My latest wall hanging. Although it is not hanging yet because my hangers and rod are missing. It was my 1st real attempt at free motion sewing. I think it turned out quite nice myself. And we will see what I come up with. I have been busy working on a few different projects with all these materials. What it all is will be revealed in a later post, as it is a gift for someone special! Happy Wednesday! Thanks for reading! We have an office station in our kitchen/dining room that has some cubbyholes for office accessories and other random things that seem to accumulate on the desk. I have been looking for baskets that I am sure are sold somewhere, but can not find anywhere. So I took it into my own hands to makes some. The perk....I get to choose what they are going to look like. 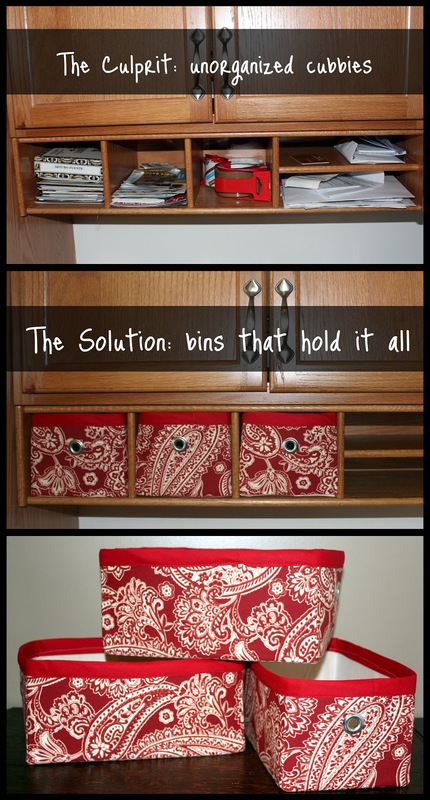 I made these fabric bins with scrap material that I had in my stash. It was a pretty easy process once all the measurements were figured out. Now my desk area looks a little more organized. Well at least some of the dis-organization is now hidden.